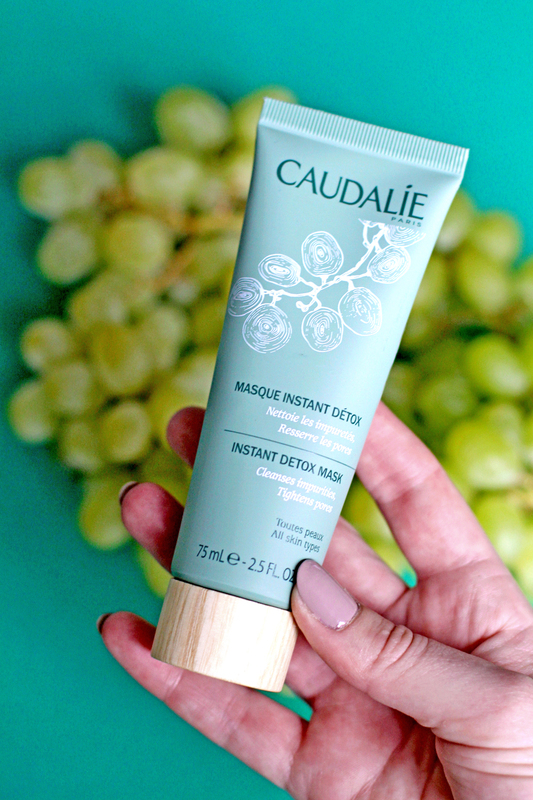 I've been trying some very exciting products lately, from French skincare brand Caudalie. If any of these seven hero products take your fancy, they'll be available on Latest in Beauty next week, so you can try them too for a fraction of the price. First comes first, let's start with the cleansers. The Make-Up Removing Cleansing Oil is a great first step to quickly dissolve make-up - including stubborn waterproof mascara - and remove impurities. It's 100% natural, smells of sweet almonds and is made with a nourishing blend of plant oils, which doesn't leave your skin feeling greasy. Next, the Instant Foaming Cleanser - Caudalie's cult cleanser - is perfect for your second cleanse. The light, gentle, soap-free foam is made with 98% naturally-derived ingredients, including purifying sage and moisturising grape extract, and gives a refreshing clean feel whilst respecting the natural PH balance of the skin. I'll definitely be buying this again. When I think of French skincare, the first cult pharmacy product which comes to mind is micellar water, and I love Caudalie's. The Micellar Cleansing Water is ideal for a gentle morning cleanse - the effective, soap-free formula is infused with soothing chamomile and suitable for sensitive skin, and lifts impurities and any residue from night products ready for the next step in your routine. The Vinoperfect Concentrated Brightening Essence is inspired by the oh-so-dedicated Asian skincare routine, and its lightweight, refined formula is gentle, effective and leaves skin feeling smooth, plump and brightened. Ingredients include glycolic acid to remove dead skin cells and white peony extracts to revitalise for a radiant glow. Press into cleansed skin before serum for an added boost of moisturiser. I've been using twice daily, and I'm hooked. The VINE[ACTIV] Glow-activating Anti-wrinkle Serum is a magical product: it's concentrated, packed with antioxidants, helps to protect your skin against daily aggressors like pollution, and leaves skin feeling gorgeous, dewy and glowy. It smells beautiful too. I'll definitely be buying this one again as well. The VINE[ACTIV] 3-in-1 Moisturiser is a light, moisturising cream for daily use, formulated to limit the amount of pollutant particles deposited on the skin, smooth wrinkles and restore a natural, healthy glow. It's suitable for all skin types and non-comedogenic, so doesn't block the pores. Last but not least - and one of my favourites as I use masks a couple of times a week - the Instant Detox Mask purifies stressed skin (and is ideal for city-dwellers dealing with pollution and free radicals), draws away impurities, and refines skin texture. It's a 99.3% natural pink clay mask, lightly fragranced with beautiful botanicals such as lavender and chamomile, and won Elle Magazine's Best Mask at the 2015 Beauty Awards. Apply twice weekly, and your skin'll thank you. Have you tried any of these? Let me know your faves!